Compared to Friday night’s Dudamel extravaganza, there was a lot of elbow room in the Musikverein’s standing room section on Thursday night for Daniel Barenboim and the Staatskapelle Berlin. But I found this evening the more rewarding of the two by a significant margin. This was the final entry in a three-concert series of Bartók’s piano concertos (in reverse order, with Yefim Bronfman) and Chaikovsky’s final three symphonies (in order). The orchestra (generally found in the pit at the Staatsoper Unter den Linden) perhaps cannot compete with the Philharmoniker of Vienna or Berlin in terms of sheer sound, but their ensemble and level of detail was very, very fine, and solo playing was also excellent. I am not too familiar with Bartók’s Piano Concerto No. 1, which belongs to the percussion section of Bartók piano music. This performance did not serve as a good introduction, with muddy playing from Bronfman that often didn’t project over the orchestra. My more-knowledgeable concert-going companion attributed this in part to the Musikverein’s obligatory in-house Bösendorfer, not a piano that specializes in crispness. The orchestra sounded excellent, though, particularly some beautiful wind solos in the second movement. The Chaikovsky Symphony No. 6 (Pathétique) that followed intermission was outstanding, and all the more remarkable for avoiding hysteria. In the first movement, Barenboim steadfastly declined to wallow in melody or overdrive the louder sections, resulting in a detached, autumnal, Brahmsian character that was strikingly fresh and persuasive (OK, OK, especially fresh if you’re a Mravinsky addict like me). Unusual details emerged, and the narrative pacing was masterful. The second movement was a hazy, otherwordly dance, the timpani in the trio emerging with rare and ghostly clarity. For much of the third movement Barenboim again kept from overdoing it, with more light, cheery virtuosity than immediate chaos. This allowed for a remarkably dramatic ending to the movement, where the orchestra finally let loose into fragmented loudness. A large portion of the audience broke into applause at the end of the movement, which surprised me, Viennese audiences usually don’t do that kind of thing, but given the performance it was a natural reaction. The last movement was a return to the character of the first; not as much Romantic tragedy but Greek in its solemn grandeur. There were encores on both halves, some Bizet piano pieces for four hands (Bronfman plus Barenboim, of course) before the pause and a beautiful bit of Sibelius’s music for Pélleas et Mélisande followed by an immensely impressive Overture to Ruslan and Lyudmila at the end. Opera house orchestras have stamina. I wish I had heard one or both of the other concerts in this series, but I heard an excellent Chaik 4 from the Royal Concertgebouw and Jansons last fall and will get a hopefully excellent Chaik 5 from the Budapest Festival Orchestra in May. But I still wouldn’t have minded more of them. Chaikovsky is overprogramed here, but he’s a composer I can happily hear over and over. Report on (sigh) Dudamel soon. I was thinking about the Bösendorfer policy on the way home, trying to remember the exception at the back of my mind, which was embarrassingly recently… Volodos in November, on a Steinway – and the clarity of sound was good from the back of the balcony. So I guess if the soloist is insistent, they get the piano of their choice; but I don't think it's often that the Bösendorfer gets questioned. The source for my information is Brendel, who explained in one of his Sunday morning Gespräche at the Konzerthaus last year that he always performed on an American Steinway in the U.S. and a German Steinway in European halls, except (cue wry smile) for the Musikverein. 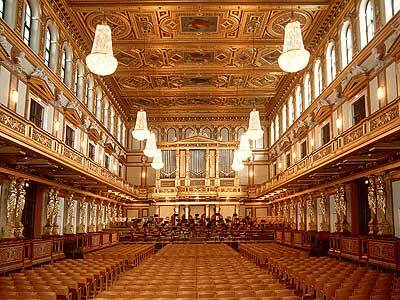 Also, whenever I've seen Fazioli evangelist Elisabeth Leonskaja at the Musikverein, it's been on a Bösendorfer. Anyway, about Thursday evening, great review – I agree with most of it! I found that Barenboim was over-shaping the return of the 2nd mvt theme, almost tastelessly so. But sentimentality wasn't a problem elsewhere, so it's a minor quibble. 3rd & 4th mvts were really great. I was more ambivalent about the 1st mvt; nicely executed exposition, but I found the brass seriously lacking in the development. Too much snarl in the trombones, totally unsubtle requiem fragments, and imbalanced ensemble with the strings. The lead-up to the standstill was completely lopsided. And then it was confusing because the brass tone was perfectly even in the coda, so I'm not sure what was going on there. But on the whole a decent performance & I'm not ashamed to admit that I applauded the 3rd movement. And kudos for identifying the Sibelius, I thought it was from Chaik op. 40; obviously not. (Sorry for the spaming, Zerb). I'm almost inclined to disagree a bit about the SKB being notably worse than the VPO and BPO (of both of which I'm the greatest admirer). Specifically a while back I heard the SKB/Barenboim in most of a Beethoven cycle at Carnegie where BPO/Abbado played some of the symphonies the following year (after 9/11) and although it varied from symphony to symphony Barenboim held up surprisingly well. (Both were quite a bit different than their almost contemporaneous CD of the Cycle would have led one to expect). Marcillac: I wouldn't say noticeably worse, and a single performance isn't really enough to say, but the SKB strings just didn't have that immediate OMG effect on me the Philharmoniker still has on a good night. I would be more than happy to have them as my home team orchestra, though.